Welcome to my guitar repair and modification shop! I have been repairing and modifying guitars since I was a teenager. 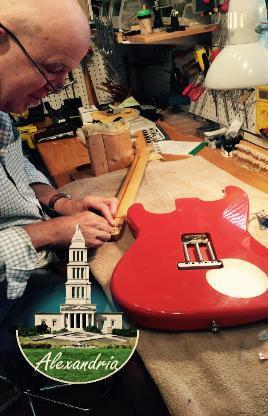 For years now I have professionally repaired, set up and modified fine electric instruments. Hundreds of parts, strings, etc. are in stock. All my work is guaranteed, and turnaround is quick. Your guitar is treated like it was one of mine, and it always goes out as much like new or better as possible. Drop-offs and pickups are by appointment, but my schedule is flexible. Click here to view a collection of completed projects! Also inspect for bad electronics and missing parts.